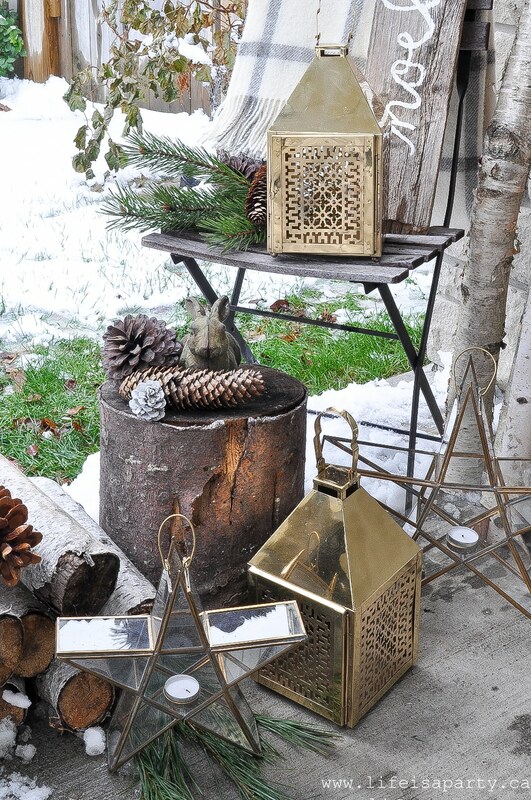 Christmas Front Porch: Rustic greens, large pinecones, and lots of birch logs create a rustic Scandinavian feel with brass lanterns for Christmas. I love to decorate my front porch at Christmas. 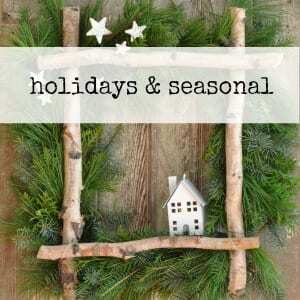 It welcomes all our holiday visitors, and is like a little introduction of the holiday decor inside. This year I’ve partnered with Amara and the front porch is looking amazing! 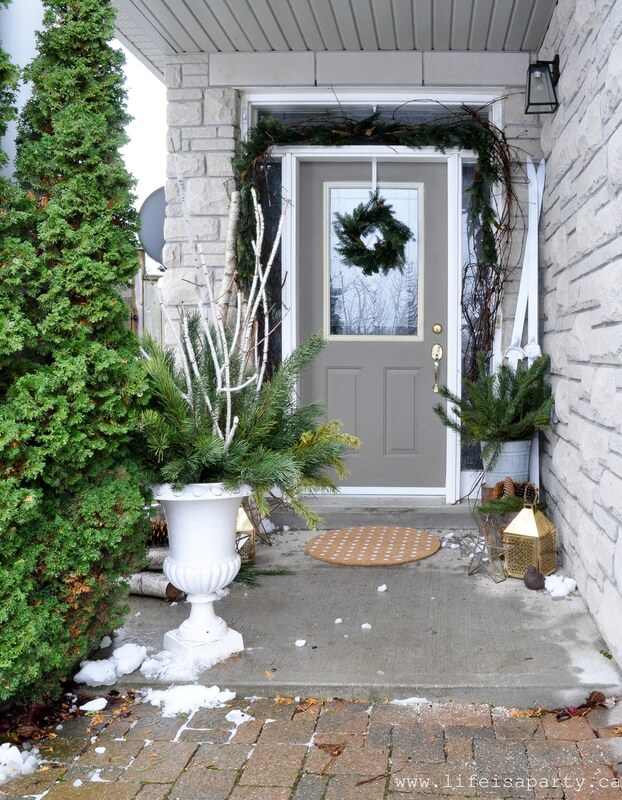 I started out by adding some garland around the door. A few years ago I foraged for some grapevine in the woods, and for the last few years I’ve stored it in the garage in the summer and re-used it each winter. It adds a real rustic feel. 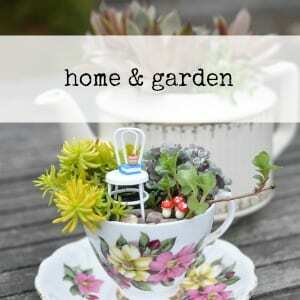 It’s held in place with some floral wire holding it to a few removable 3M large hooks. 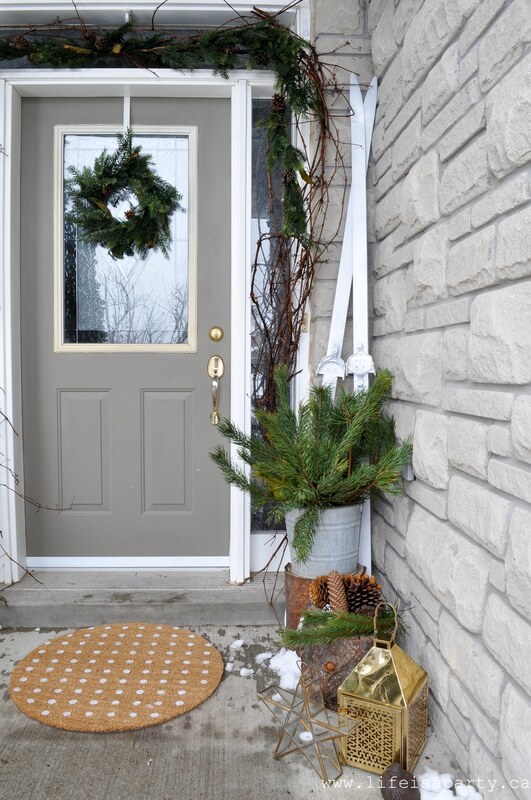 I also layered on top of the grapevine the “Deco Natural Pinecone Garland” and added the matching wreath to the door. 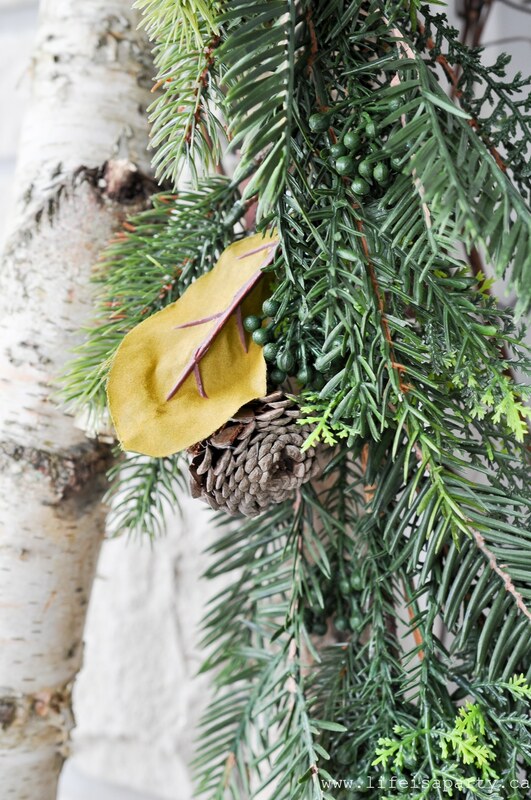 I love the mix of greens it included, and the magnolia leaves, as well as the real pinecones. 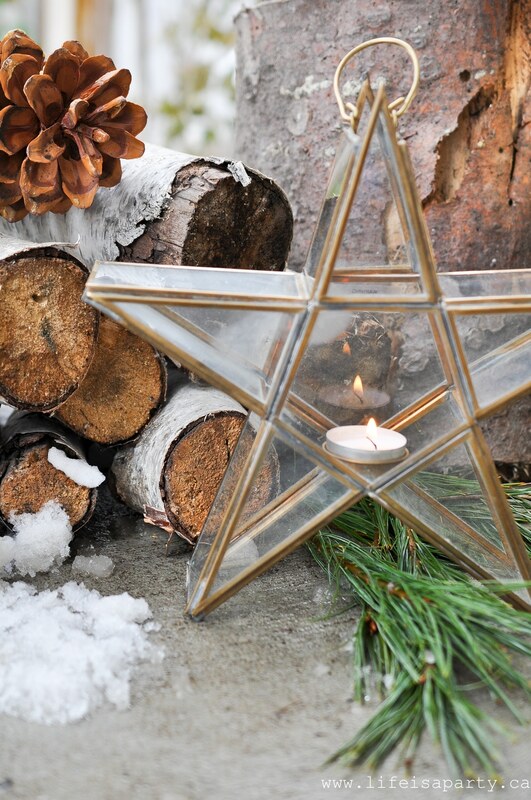 It’s nice having some faux pieces that look so realistic, and can be used year after year. 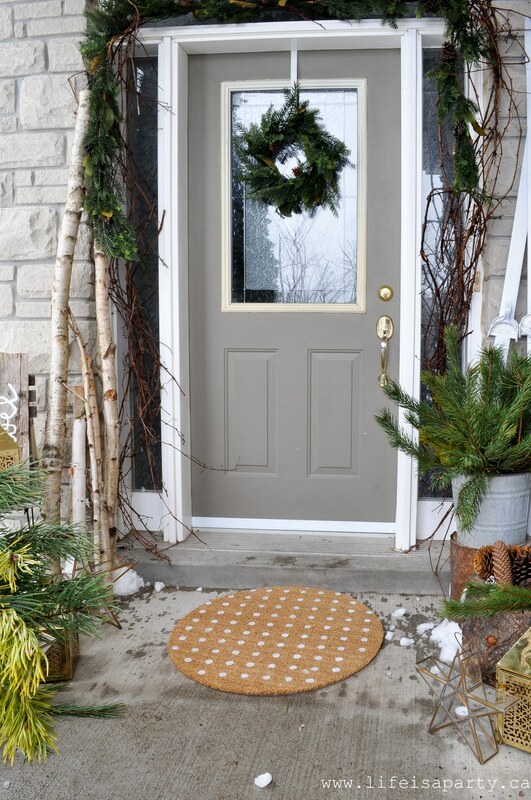 In front of the door is the cutest doormat -I love that it’s round, and I love the polka dots. It kind of reminds me of snow. 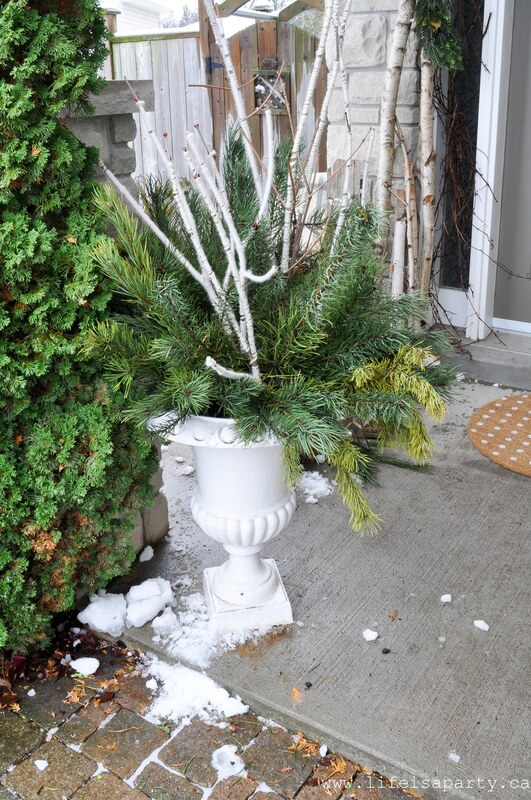 Beside the door is a really simple arrangement of pine in a vintage bucket. The pine is some I collected in the woods. I kept the urn very simple this year too. It’s more foraged pine and some yarn wrapped branches in the middle. 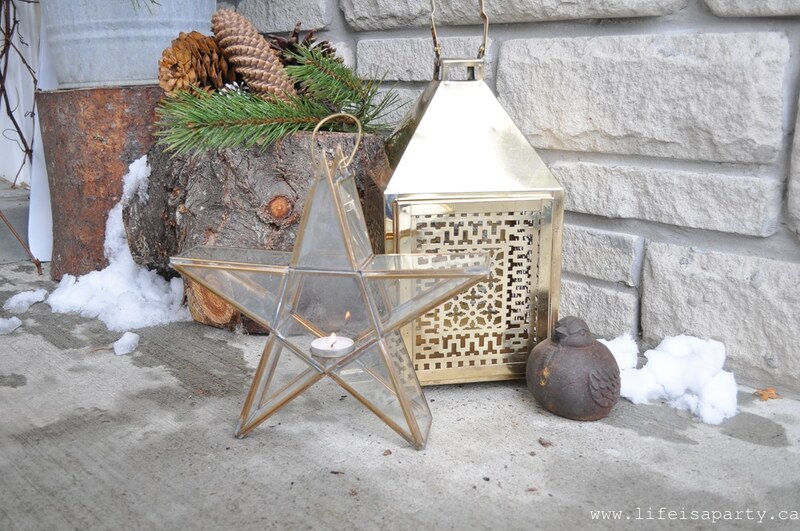 The star of the show this year are the beautiful lanterns. 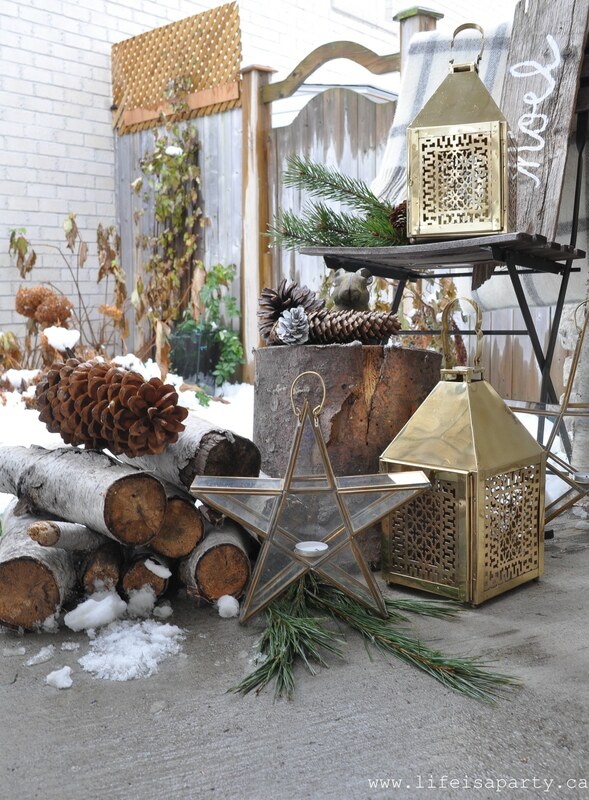 The brass cutout lanterns are gorgeous, and a real favourite of mine. 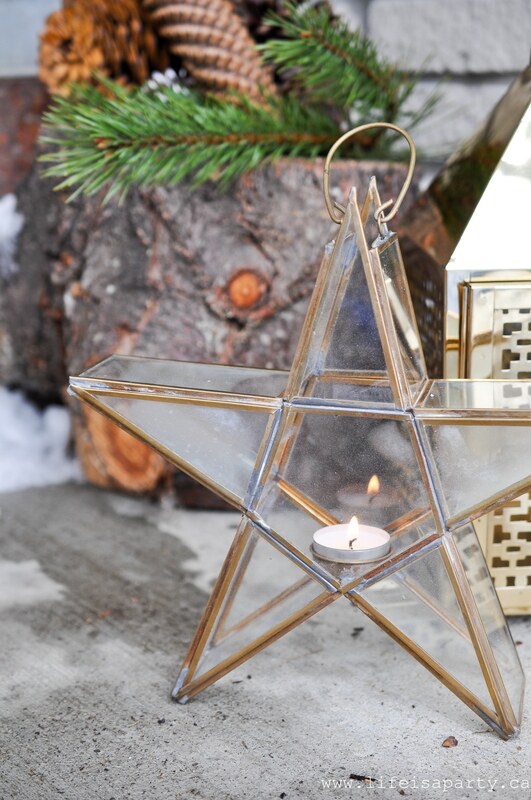 I paired them with these beautiful glass and brass star lanterns which are perfect for Christmas. And over on the other side of the door, a slightly larger grouping. 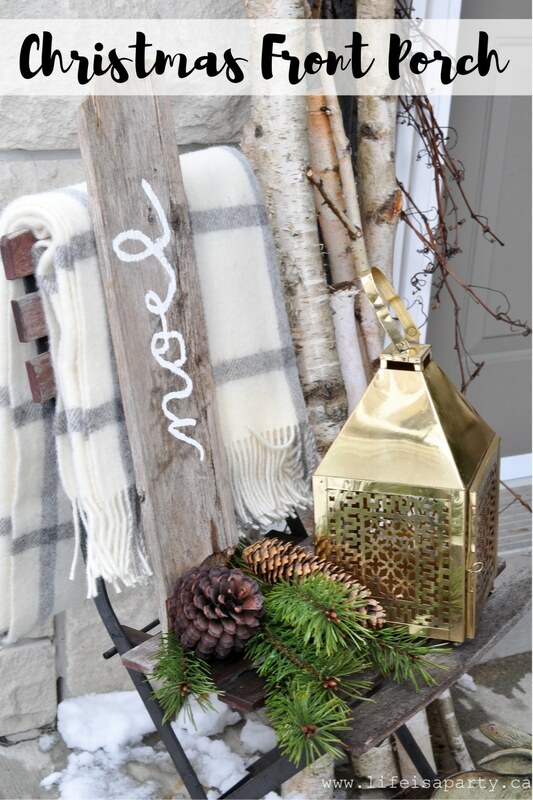 I’ve styled the front porch with lots of logs, greens, and pinecones and I love how rustic it feels. The Noel sign is rustic little DIY from a few years ago. I found an old board on a walk from a decaying pallet and brought it home. I used chalk to write my word and then went over it with a little craft paint. 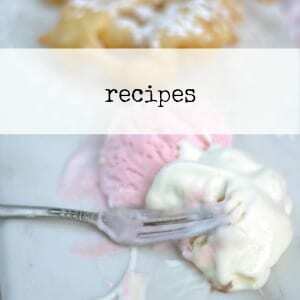 And the sign is resting on the most beautiful wool plaid blanket in cream. 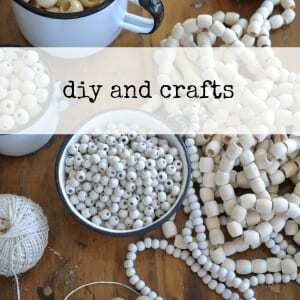 Over on the other side, one more quick DIY with the skis. 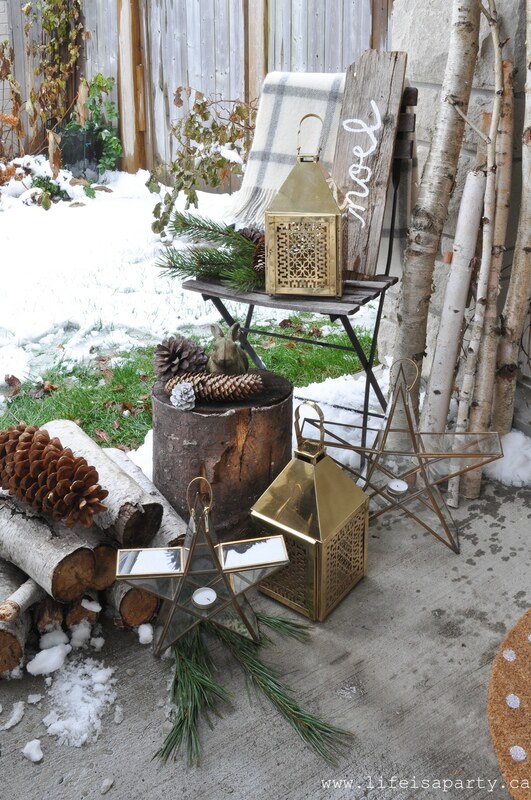 I’m so happy with this welcoming spot, and how great the rustic elements looked with the beautiful brass lanterns -they help make the space feel festive and extra special. 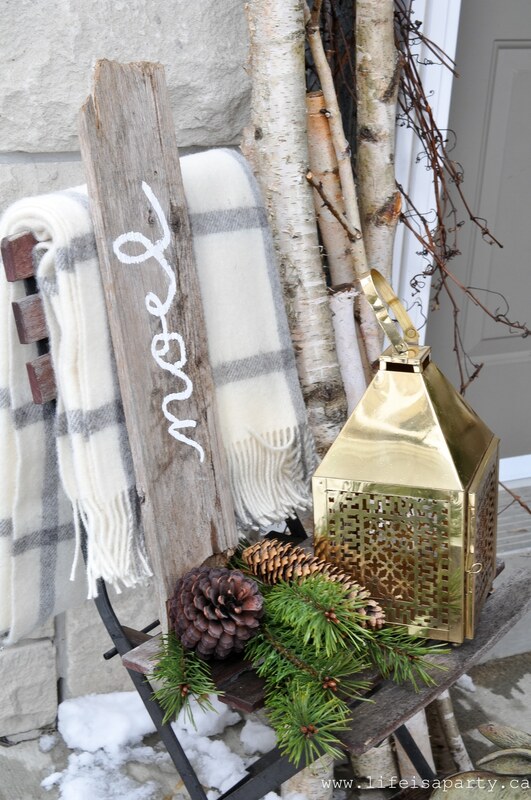 With a front porch all dressed up for Christmas, life really is a party! This post was sponsored by Amara. All opinions, as always are my own. 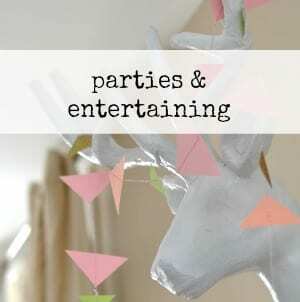 Thanks for supporting the brands that make Life is a Party possible. looks fabulous, i love this simple natural look, especially with your door color, too!